Neutrons Matter, the seventh edition of the International Workshop on Electron-volt Neutron Spectroscopy, celebrates the 85th anniversary of the discovery of the neutron by James Chadwick, and the 80th anniversary of the patent issued by the Ministero delle Corporazioni on 27th October 1937 to Enrico Fermi for the use of neutrons to enhance artificial radioactivity. The last discovery took place at the Istituto di Fisica di Via Panisperna at the very heart of Rome. Following a successful sixth edition of this workshop series in the United Kingdom in 2014, we aim to bring to the fore and highlight the most recent (and quite exciting) advances in the field, with an emphasis on the use of the technique across condensed matter research, as well as the concurrent use of contemporary computational materials modelling. 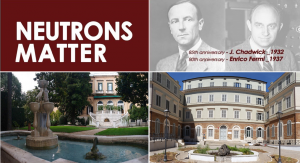 The workshop will be held in Rome, in the beautiful setting of Villa Wolkonsky and at the Centro Fermi – Museo Storico della Fisica e Centro Studi e Ricerche Enrico Fermi.